I refinanced my home with Jim Apessos. He was great, friendly & accommodating, and always called to let me know how things were going with my loan process. Refinancing with Midwest Equity and Jim was fast and easy! I can't recommend them enough. - Holly H.
With Midwest Equity, you won't be stuck in an automated phone system and have to talk to a new person every time you call. We have built our no-hassle, streamlined loan process to specifically meet your needs. Close on your home loan quickly and efficiently with Midwest Equity Mortgage, LLC. Plus, you may skip your next month's mortgage payment. 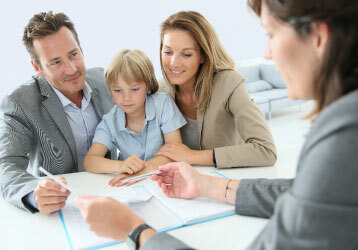 Midwest Equity is an established mortgage company with decades of experience. We pride ourselves on being a direct lender with fast, professional and courteous service. We're a BBB Accredited Business of the highest rating. Do you have a mortgage AND a car loan, student loan, or credit card debt? Simplify your life! Consolidate your consumer debt down to only one payment per month - all while paying off your home sooner and lowering your overall monthly payment. The Mortgage Assured program is a unique option to give you the power to get the home you want. Get more than just a pre-approval; receive a commitment to lend. By getting Mortgage Assured, you can make an offer with confidence. We'll help you through every step of the process. Get Mortgage Assured: Find out how much you can afford. Partner with an Expert: Contact a Midwest Equity Mortgage, LLC specialist to help you secure a mortgage at a great rate. The team at Midwest Equity Mortgage, LLC is dedicated to helping our customers make the most of their largest and most important investment - their home. Our company strives to go the extra mile. With Midwest Equity Mortgage, LLC, you won’t be stuck in an automated phone system and have to talk to a new person every time you call. Talk to a real person with mortgage expertise. Work with one loan expert from start to close. Receive guidance throughout the entire mortgage process. Adam Miller made everything easy and he took the time to explain the process to a first-time buyer. Very helpful and even did better than he originally expected with interest rate and terms. We closed fast and Joe stayed in close contact with us through the entire process. I couldn't be happier with Midwest Equity and Jim Apessos. Jim was honest and upfront about the entire process and I was signing loan documents in 2 weeks. He found the right loan for me and the process was hassle-free. "John Busher assisted with my home refinance and the entire process was painless. The loan funded from start to finish in less than 3 weeks, and John followed up with us and all of the parties involved, to ensure a professional and pleasant experience. I highly recommend John for refinancing needs." I just wanted to say that Carl Baker helped me with my loan and he was awesome. He and his processing team were on top of everything, he was very thorough and very precise. His knowledge helped me tremendously, so thank you again. Pete possesses all the traits of a professional. His many years in the business make him extremely knowledgeable and helpful. Pete is great to work with and is responsive to his all of the client’s needs. We have done both mortgages and refinancing with him and wholeheartedly recommend him to friends. I refinanced my home with Jim Apessos. He was great, friendly & accommodating, and always called to let me know how things were going with my loan process. Refinancing with Midwest Equity and Jim was fast and easy! I can't recommend them enough.